Car Leasing Concierge. The new Mercedes AMG Project ONE supercar. In a predictably dramatic fashion, Mercedes-AMG has released its long-awaited F1-derived hypercar at the Frankfurt Motor Show. Lewis Hamilton was at the wheel of the AMG Project One, coaxing the hybrid hypercar out onto the stage to much applause. 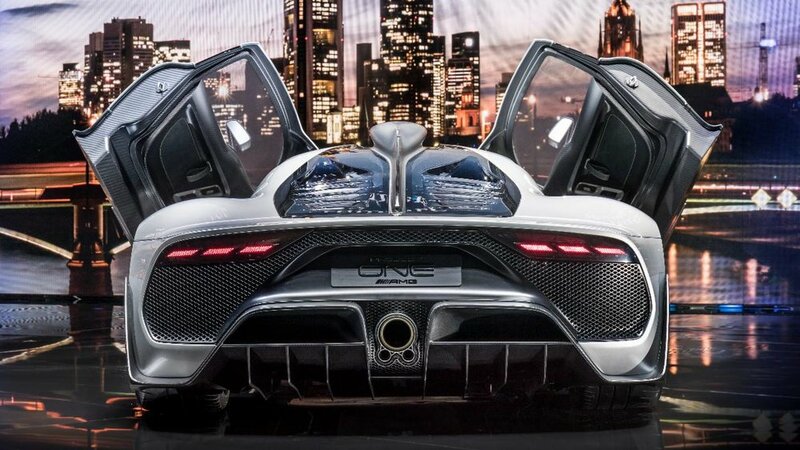 Although the teaser silhouettes of the car gave a hint towards an LMP-style front end, it turns out that the Project One is in fact more akin to a more generic hypercar than once thought. The front profile of the car has something of the Noble M600 about it and the lower vents scream Ferrari 360. The cockpit is conventionally placed instead of the Le Mans car styling that was once presumed. The presumption was that the AMG would have extremely short overhangs (much like the Porsche 919 Hybrid) but instead its proportions resemble (if anything) a Porsche 918 Spyder. The looks may seem a little underwhelming but the stated performance certainly isn't. The combination of the 1.6-litre turbocharged V6 derived from the Mercedes Petronas Formula 1 car with four electric motors amounts to a total power output of over 1000hp. That power then gets the car from 0-200kph (124mph) in under 6 seconds and will see it reach over 350kph (218mph). The engine has been developed and manufactured in AMG's plant in Brackley, UK and the electrical motors and batteries on board give the car a 25km in all-electric mode. The power plant has been stated to achieve 40% thermal efficiency in comparison to 33% often achieved by standard internal combustion engines. To further the surge towards efficiency, two of the four electric motors are found on the front axle, both of which can be used to recuperate 80% of braking energy to be recycled and stored in the car's battery packs. Mercedes-Benz have produced some fairly outlandish cars in the past like the McLaren-Mercedes SLR and the CLK GTR, but the Project One will be a tectonic shift in the performance car landscape. Although the Aston Martin Valkyrie looks to be a bit more F1-orientated in terms of looks, the performance claims from AMG mean that the Project One can truly have the tag as 'an F1 car for the road'. What do you think of the AMG Project One's design? Has it lived up to your expectations? And if not, does the claimed performance make up for it? Comment with your thoughts below!